The next day, I got a ride from a professor back onto the Harbor Freeway and then west onto the Century Freeway to the airport. He was driving a Volt and said the 40 mile battery was just enough to get him back and forth from his house at Hermosa Beach. Also, it allowed him to use the HOV Connector (53 2682E) that we had climbed onto to avoid the heavy traffic. This complicated interchange was another project that I worked on in the 1980s. It was so densely packed that we had trouble finding room to put our columns, some of which were 150 ft high with big outrigger bent caps. I designed some of the smaller connectors but I had to use C-bents to step around the bridges and roads. 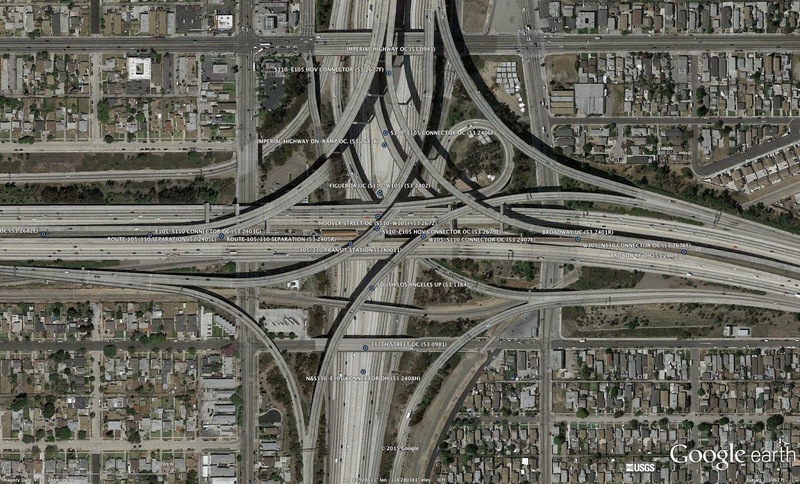 Los Angeles County, California Bridges: E105-N110 HOV Connector OC by Mark Yashinsky is licensed under a Creative Commons Attribution-NonCommercial-NoDerivatives 4.0 International License. A C-Bent is where the superstructure is supported eccentrically (to one side) rather than directly under the center of the superstructure.